Belgium’s busy-as-a-beaver death metal sickos ABORTED have recorded two new tracks for you! The singles will be out on their forthcoming EP, Bathos, which will be available as a digital download via CENTURY MEDIA RECORDS on July 7, 2017. You will be able to listen to Bathos in advance of its release through your favorite streaming/download platform on June 30! 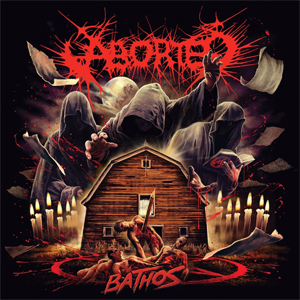 Bathos is a fine example of what ABORTED have managed to achieve by hard work, focus, excellent musicianship and unwavering self-belief by offering two prime tracks of relentlessly raging, barbaric and horror-laden insane brutal death metal.